Two of the East’s strongest and most dynamic teams will face off on Friday night in Hog Town, as the Raps get ready to host the Cavs, who realise that it’s been nearly two months since Toronto lost at home. Don’t be fooled, Cleveland has taken notice and will fight hard to bring the Raps home stance record to a quick halt. The Raps won’t be so easily dominated though. Between these two highly offensive and successful teams, only three games separate them in Eastern Conference. They are the conference’s top two teams who will vie for home court advantage as the playoff stretch nears. The Raptors will look to lessen the deficit between the two when the Cavaliers visit Air Canada Centre tomorrow night, in front of a rowdy and excitable home crowd. Toronto is a solid 38-18, and hasn’t let the Cavaliers distance themselves too much in the race for the East, by basically winning 17 times in a 20-game stretch. They did this for the first time in team history and that’s probably just a small sign of things to come from the Northern team. The Rapts have been unbeatable at home over that period too, having won nine straight, matching a single-season franchise which was set from March 7 to April 4, way back in 1999. If they win tomorrow night they can can tie the club mark for consecutive home wins set between the 2001-02 and 2002-03 seasons. They extended their streak on Wednesday with a 114-105 win over Minnesota Timberwolves. Cleveland is a dominant 41-15, and has been able to keep their hold on the top spot by winning 11 of 14 despite losing in coach Tyronn Lue’s debut on Jan. 23. They had a five-game winning streak broken with Monday’s 96-88 home loss to Detroit, but they didn’t dwell on that long and quickly recovered in Wednesday’s win of 114-103 over the challenging Charlotte Hornets. 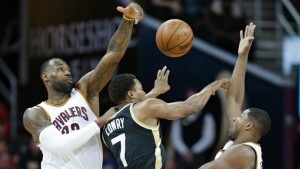 Early on against the Pistons, LeBron James was kept to a season low on the scoreboard, getting only 12 points on 5-of-18 shooting, but he was able to bounce back by scoring 10 of his 23 points in the first quarter and helped the Cavaliers to a season-high 40 points in the second half. “It was fortunate for us that LeBron was able to attack early and set the tone for us,” Lue said. The 31-year-old James is insisting taht he feels “10 times better” physically now than he did a year ago but acnowledges that he’s not spring chicken anymore. Cavs’ Kyrie Irving also had 23 points in that game. Channing Frye went 4 of 8 from 3-point range in recording 15 points in his second game since he was acquired from the Orlando Magic last week at the NBA’s trade deadline. “He adds another dynamic piece to our team we hadn’t had up to this point,” James said of Frye. Frye, is a career 38.7 percent 3-point shooter, and adds another outside threat to a Cleveland team that’s had much success from the perimeter in two prior 2015-16 meetings with the Raps. The Cavs were 14 of 29 from beyond the arc in the last game they played in Toronto, a 103-99 loss at Air Canada Centre on Nov. 25. They finished 17 of 33 in a 122-100 home beating later on, on Jan. 4. Irving has returned from a seriously fractured kneecap that took place last June, and that has made all the difference. He had 25 points in the last matchup after missing the first game, and is averaging 24.3 points on 52.8 percent shooting over his last seven games. So he is hot and a player the Raps will have to defend well. The Raptors are propped up by the fantastic play led by their All-Star backcourt of DeMar DeRozan and Kyle Lowry. The dynamic duo combined for 52 points against Minnesota, and they hit two critical 3-pointers each in the final 3 1/2 minutes so Toronto could close the game out on a 13-4 point run. “It was a gutsy win. We found a way to win defensively and DeMar DeRozan made some big plays down the stretch,” said Toronto coach Dwane Casey. DeRozan ended the last game with 31 points and is averaging 25.3 points over his last 11 matches. Lowry has scored 12 of his 21 points in the fourth quarter and didn’t have one turnover. He’s had only six giveaways over a five-game stretch where the Raptors are averaging a league-low 9.6 turnovers per game. That’s strong defensive play that keeps their opponents desperate to make plays and mistakes. On the other side, Cleveland did do a better job taking care of the ball in their last game Wednesday. They committed 18 turnovers, six from James alone which led to 23 Detroit points overall, whereas compared to game against the Hornets, the Cavs had only nine. Head to head Cleveland has won four of five against Toronto, but the Raptors are playing sound basketball and don’t feel pressured, which means they will control the ball and the momentum of the game. We predict the streak will continue.